Did you know that stress is the most popular reason for hair loss among men? Excessive stress can lead to conditions such as telogen effluvium, a disease which causes the thinning of the scalp by reducing the growth of hair follicles. One of the most effective means for treating stress is exercise. Engaging in physical activity has proven to benefit patients suffering from conditions such as anxiety and depression. The endorphins that are released while exercising enhance our immune system and give us pain relief. So before you start hitting the weights; take a minute to learn about some of the key exercises that are most likely to release endorphins and prevent hair loss. Everyone responds to endorphins at different levels and times. Some people experience the rush just minutes into their workout where as others experience it half an hour later. Remember, it takes a while for your body to get acclimated to releasing endorphins again, so don’t freak out if you don’t see you hair growing back within a week. 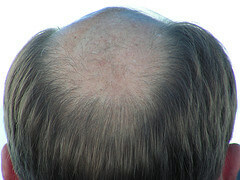 For more information on what to do about thinning hair, ask your barber at Dave’s Barber in Woodstock, GA.